Do You Have the Guts to Be Good? 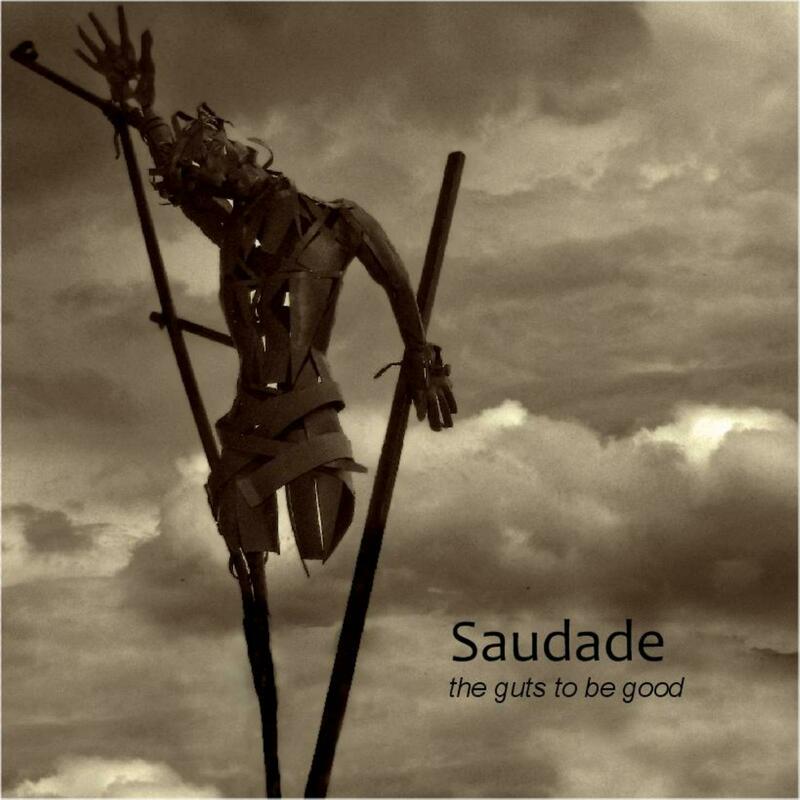 So, I’m happy to say that on Monday I’ll receive my shipment of Saudade “The Guts to Be Good” CD’s. I kept it very simple, with a very cool sleeve design by Stijn Coppens. It is a cardboard sleeve (no jewel case) with no extended booklet. This way, it looks good, but I can keep the price very low (retail $6). “The Guts to Be Good” represents songs that were written in 2008 and 2009, as apposed to the previously released singles, “Bad Dreams” and “Like You” which consist of remakes of songs I wrote when I was a teenager in the 80’s. These newer songs seem to follow a general theme, but in different ways. I like concept albums, but don’t like everything on the album to be too similar or too obvious. This album takes different looks at the attempt to be a good person, both in a melancholy way, and in a light, fun-loving way. It begins by asking whether anybody has “the guts to be good” in a world where the right way is often not the easier path. Then, with the song “Almost Perfect”, there is a description of those seemingly perfect days when everything seems to be going great, and you feel like “you’re there!” Yet you know that there are still struggles ahead, and it may not be until some far future time when you can finally look back and see that the journey was worth taking. “Missing” is more of a song about longing for something, or someone that is lost. “Mocking” was written mostly as a pop song and the lyrics are more on the silly side of the spectrum, using wordplay and rhymes while lightheartedly exploring the feelings of being mocked or misunderstood. Sure, there is a misfit in most of us. “The End of This Disease” was written and recorded in a day, after I found that my brother had been hospitalized for Crohn’s disease. While he was recovering from surgery he made a social network for people dealing with Crohns. I wrote the song as a sort of theme song for him. We are often asked to deal with disease and suffering in life, regardless of how “good” we try to be– again, that’s part of the journey. There are two little tracks on the CD that are mostly instrumental. I made them as little experiments while playing with ideas. One of them, “Something in the Sky” drives some people crazy (like my wife) because there is a synth pattern that plays five pulses per “beat”, and five pulses per beat just sounds “off” because it isn’t the usual, easy-to-hear 4, and it’s not even a triplet. Hey! I like breaking the rules. The pattern is right on the “beat” but just doesn’t sound natural, which I think makes it cool. “Thoughtless” was a short song where I wanted to snap at people who question the faith or belief’s of others, treating them as if they are unintelligent or even complete idiots for believing in things they can’t see. I don’t mind if people believe differently than I, or if they don’t embrace any kind of faith at all, but I don’t appreciate when I’m called a fool for my own view. Insults never promote understanding. I didn’t want to follow a typical song structure with several verses and chorus repeats. I thought it best to just blurt it out, then leave it. After all, when your faith is being attacked, you usually just want to walk away. There is no convincing somebody who can’t see things through similar eyes of faith. Knowledge of things unseen can only be won by those who try and test their own faith. “Kansas Again” was written while I was on a long road trip with my son. We were driving from Smithfield, Utah to Dallas, Texas, and back again. The lyrics were jokingly adapted to the places we were driving through (Wyoming and Kansas) and are meant to talk about how it feels to be stuck where you are, unable to leave when your life seems like you’re stuck in Kansas again. Now, I know Kansas has its own charm, but for a guy who has lived most of his life around beautiful mountains and scenic landscapes, that particular state seems pretty dull. It is so flat, and it’s just farm fields as far as you can see on every side. Anyway, the song is not very profound. The challenge was that I had to make the song about 12 minutes long because we shot a photo through the windshield every 10 seconds during the entire trip. Then we played back the photos at many frames per second to show a time-lapse of the entire round-trip. My song would be a soundtrack for the video. Since I’m a fan of old extended versions anyway, I thought it was a fun project. The finished video has the rough mix of the song (not the final one on the album). There are a couple of remixes on the collection from friends of mine. One is a remix of “Mocking” by my great friend, Marcus Fellechner, who I work with for the band Rename. He has a great feel for pop music and make the song much better than the original, as he usually does. There is also a remix of the song “Her Way” which was from my 2nd Saudade single. Steve Mork from Somegirl has a great way with melancholy, moody songs (the first Somegirl album was ideal for that) and he made a great remix of that overly dramatic song from my youth. I wanted to release it on a CD, so I put it here. The album ends with a somewhat heartbroken look at a life spent in an endeavor that collapses due to changes in the world, while suggesting that even at the end of the dream, some things can’t be taken away. I admit, I was feeling very emotional and disappointed at the time I wrote this song. I just wanted to get my feelings off my chest, so to speak. During the spring of 2009, the long, downward path of my music business, A Different Drum, seemed to worsen. I was particularly upset that I’d made contracts for some great new artists, then had to tell them over and over again that I didn’t have the money to release their albums as planned. Without sales, there couldn’t be new releases or my debt burden would become insurmountable. There were already a lot of debts and my own income was down to pretty much nothing, just so I could pay the bills. I felt unemployed, even though I was working all the time. I’d tried other things, but nothing had worked out. I eventually took a summer job selling corn for a neighbor because I couldn’t see things getting better during the traditionally slower summer months. It seemed everything was crumbling. It still is, to some degree, but I wanted to write a personal song about the way it felt to wake up from the dream I’d been living for so long. I intentionally sung the song in a more whiny style, thinking it sounded more like I was cracking. It had worked nicely for Robert Smith (The Cure) so many years before. Though I don’t expect many people to connect with this song, it became my favorite and I felt like it was a sort of anthem for me at the time. Oh, I had also contact a singer named Sheri Shaw about contributing her great voice on the chorus because she has a certain vocal timbre that I felt fit the mood perfectly. I ended up liking her voice so much that I not only used it in “Somnium Finis” at the end of the album, but I created a little intro for the album using her chorus vocals and called it “The Dream”. So, she kind of ties the album together from beginning to end. One of the fun parts of working on my Saudade project is that I decided to accompany as many of the songs as possible with no-budget, home-made music videos. My son, Dylan, became a big part of that endeavor. Last year he became very interested in photography and in video recording. He only had a little $60 hand-held video camera (very cheap and low quality) but we decided to work with it and make some silly videos. I tried to think of ideas that only loosely tied into the lyrics of the song. Thus the videos could cause for a different interpretation, or could simply be a background visual. Lately, I’ve felt like Dylan and I have put together some pretty cool no-budget videos and are improving every time. He has since purchased a new camera– it’s still cheap at under $300, but provides much clearer shots, and we just picked up some inexpensive editing software (for most of the videos to this point we’ve used free software for editing). Keep in mind, these videos are always shot and edited in a day…usually in three hours or less. There are videos for songs from the first two Saudade singles, and there are also videos for songs from the future Saudade release “Restricted”, but here are the videos that are tied to songs from “The Guts to Be Good”. These include more interesting productions, the time-lapse road trip, a couple of videos that were added to the instrumental tracks just for kicks, and even a video that Dylan shot entirely with his friend while goofing off one day…it fit nicely with “Mocking”. Well, there is some unsolicited insight into my Saudade album, “The Guts to Be Good”. I am nearing completion of the next collection of songs called “Restricted”. There are already a couple of Youtube videos for songs from that concept album, but I won’t go into that during today’s blog. The CD will be available in about a week from Amazon.com as well. Congrats, Todd! I really dig the CD cover! I listened to most of the songs and Mocking is my favorite. The last video was especially creative and clever. Here’s to dreams coming true! Thanks for sharing some of the thought processes behind the songs. The cover looks great! This entry was posted on October 16, 2009 at 4:03 pm and filed under Uncategorized. You can follow any responses to this entry through the RSS feed. You can leave a response, or trackback from your own site.